CHARLOTTE (April 14, 2016) – CARSTAR North America, the continent’s largest network of collision repair shops and a member of the Charlotte-headquartered Driven Brands family, will make its debut in the NASCAR Sprint Cup Series at Kansas Speedway this May. This opportunity is thanks to a joint promotion with CARSTAR’s new paint partner Axalta Coating Systems. The No. 88 Axalta/CARSTAR Chevrolet SS, driven by NASCAR’s 13-time most popular driver, Dale Earnhardt Jr., will race on Saturday, May 7, in Kansas City, KS. The CARSTAR logo will be featured prominently on the car. In Kansas, Earnhardt Jr., a 26-time Sprint Cup winner, has had three top-five finishes, nine top-10s and one pole. He has led 146 laps at the 1.5-mile speedway. 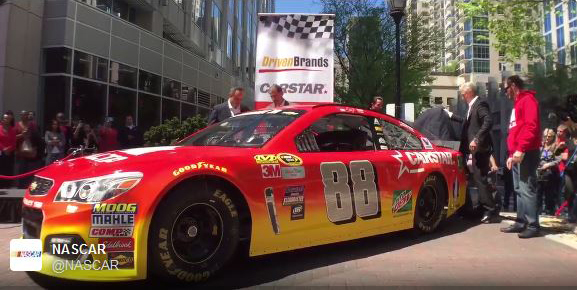 “It will be an honor to carry the CARSTAR colors on the No. 88 Axalta car and represent the CARSTAR shop owners and thousands of employees across North America at Kansas this spring. I hope we’re able to take them to Victory Lane on Saturday night,” said Jim Muse, Axalta’s North America Sales Director. As part of the race weekend, Axalta and CARSTAR will host top CARSTAR franchisees from across North America, along with prospective franchisees and corporate team members. For updates on the No. 88 Axalta/CARSTAR Chevrolet SS and Earnhardt Jr. during the race weekend, visit www.carstar.com/kansasrace and follow CARSTAR on Facebook and twitter.